The PR agency/client relationship can be a delicate dynamic, especially when things aren’t all rosy. The fortunes of a company and its PR agency are inextricably linked, and a good PR team must have the confidence and courage to deliver bad news when necessary. After all, PR pros are in the communications business. To the client, bad news or constructive criticism may feel uncomfortable, but an open channel of communications is key to a fruitful client-agency partnership. A good PR agency tells you when.. Your message doesn’t measure up. A company’s message can be a powerful differentiator, and it should show in its communications, from social media posts to CEO bylined articles. A business may think it has fully defined its brand voice, but it may have a narrow view, or one based on technical superiority. If the story isn’t sufficiently compelling and different, the PR team needs to say so. Then all need to start the work of transforming a list of product attributes into compelling, media-ready storytelling. The PR agency brings valuable objectivity and experience to the table, and a good team will collaborate on defining and fleshing out the brand voice and its story. A good test of whether an agency is willing to speak up is what they tell you before the agreement is signed. Your branding is holding you back. Not every PR professional is a branding expert, but we are experts in messaging. At times, a company’s branding or advertising will compete with the PR messaging, or it simply doesn’t fit the story the PR team is serving up to media. We once had a client who set out to market a high-priced item of luxury women’s apparel under a brand that was contrived and downmarket in its style and tone. Remember, public perception is driven by visual branding, marketing, and public relations (among other functions), and inconsistencies will harm or fragment that perception over time. A smart client will make sure the PR team has a voice in key branding changes and decisions, and a good agency will use it. What to expect when you’re expecting (too much). It’s certainly tempting to ride the client’s wave of optimism or ambition. We want to say yes, we can do that! There’s nothing wrong with aiming for the stars – as long as you don’t expect the universe. An experienced PR team will manage expectations by outlining tangible deliverables and measurable goals at the outset. An early- stage company may not have a roadmap for reasonable expectations of activities like pitching, content, or earned media coverage. The PR team will be doing a disservice to everyone involved by allowing expectations to exceed reality. A company may not want to hear that the PR team can’t control the final edit of the CEO interview, or that the first month may not break records for coverage, but it’s the PR team’s responsibility to make sure the client knows what to expect and when to expect it. How to face the music. When things go south, a business cannot bury its head in the sand. It may want to let a crisis blow over, or just go quiet until the next news cycle, especially if the criticism is undeserved. A CEO may feel reticent to acknowledge unflattering reviews or misbehavior that comes to light. 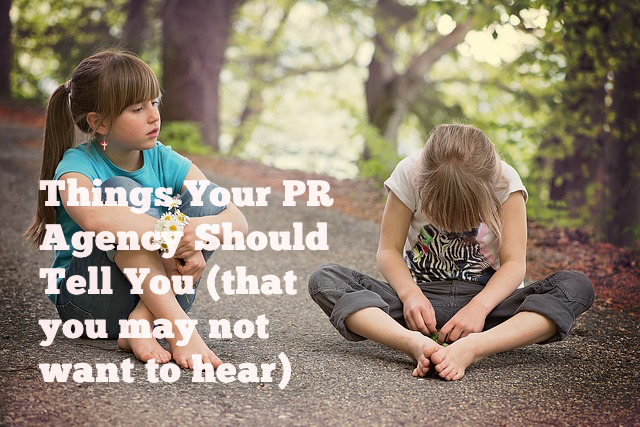 Here, a good PR firm will urge the company to do what in its best long-term interest. In most cases this means to face the reputation crisis with sound advice and appropriate action. Everybody’s a critic, including the PR agency. Part of a PR team’s job is to critique the client’s performance in media interviews and public speaking. A good PR rep will be on the phone or in the room for the media meeting, and he’ll offer constructive criticism about the conversation. In a less direct way, a PR team will often hear feedback about its client’s business or communications from journalists, analysts, or stakeholders. Where that feedback is valuable and relevant, it should be passed on and incorporated into programs going forward. In today’s world, communications isn’t about broadcasting your message or story to customers; it’s also about listening to the perceptions and responses of high-value audiences. The good news is that hard conversations actually lead to a better working partnership. A solid agency-client relationship thrives on collaboration and open communication, so a good agency will offer it and a good client will welcome it. For some advice on how to tell a client they are wrong, see this earlier post.